For the name, see Amadou (name). Amadou is a spongy material derived from fungi that grow on the bark of coniferous and angiosperm trees, and have the appearance of a horse's hoof (thus the name "horse fungus"). It is also known as the "tinder fungus" and is useful for starting slow-burning fires. The fungus must be removed from the tree, the hard outer layer scrapped off, and then thin strips of the inner spongy layer cut for use as tinder. Amadou was a precious resource to ancient people, allowing them to start a fire by catching sparks from flint struck against iron pyrites. Remarkable evidence for this is provided by the discovery of the 5,000-year-old remains of "Ötzi the Iceman", who carried it on a cross-alpine excursion before his death and subsequent ice-entombment. Amadou has great water-absorbing abilities. It is used in fly fishing for drying out dry flies that have become wet. Another use is for forming a felt-like fabric used in the making of hats and other items. Before such uses, amadou needs to be prepared by being pounded flat, and boiled or soaked in a solution of nitre. One method of preparation starts by soaking a slice in washing soda for a week, beating it gently from time to time. After that it has to be dried; when dry it is initially hard and has to be pounded with a blunt object to soften it up and flatten it out. ↑ Cotter T. (2015). Organic Mushroom Farming and Mycoremediation: Simple to Advanced and Experimental Techniques for Indoor and Outdoor Cultivation. Chelsea Green Publishing. p. 281. ISBN 978-1-60358-456-2. ↑ John Van Vliet (1999). Fly Fishing Equipment & Skills. Creative Publishing. ISBN 0-86573-100-4. 1 2 Jon Beer (October 13, 2001). "Reel life: fomes fomentarius". The Telegraph. ↑ Greenberg J. (2014). 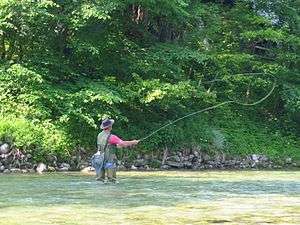 Rivers of Sand: Fly Fishing Michigan and the Great Lakes Region. Lyons Press. p. 93. ISBN 978-1-4930-0783-7. ↑ Pegler D. (2001). "Useful fungi of the world: Amadou and Chaga". Mycologist. 15 (4): 153–154. doi:10.1016/S0269-915X(01)80004-5. In Germany, this soft, pliable 'felt' has been harvested for many years for a secondary function, namely in the manufacture of hats, dress adornments and purses. Look up amadou in Wiktionary, the free dictionary.